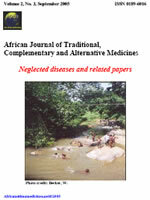 The African Journal of Traditional, Complementary and Alternative Medicines (AJTCAM), a new broad-based journal, is founded on two key tenets: To publish exciting research in all areas of applied medicinal plants, Traditional medicines, Complementary Alternative Medicines, food and agricultural technologies, and promotion of healthy use of medicinal products. Secondly, to provide the most rapid turn-around time possible for reviewing and publishing, and to disseminate the articles freely for teaching and reference purposes. All articles published in AJTCAM are peer-reviewed.